Craven, Claudia L. Thompson, Simon D. Toma, Ahmed K. and Watkins, Laurence D. 2019. Superficial and Deep Skin Preparation with Povidone-Iodine for Ventriculoperitoneal Shunt Surgery : A Technical Note. Journal of Korean Neurosurgical Society, Vol. 62, Issue. 1, p. 123. Steinsapir, Kenneth D. and Woodward, Julie A. 2017. Chlorhexidine Keratitis. Dermatologic Surgery, Vol. 43, Issue. 1, p. 1. 2016. Krankenhaus- und Praxishygiene. p. 9. 2016. Meyler's Side Effects of Drugs. p. 239. Page, Joshua Cody and Peters, Bob 2015. Hearing Loss Caused by Surgical Antiseptic in the Setting of an Unknown Tympanic Perforation. Otology & Neurotology, Vol. 36, Issue. 10, p. 1583. Scheithauer, S. Möller, M. Höllig, A. Marx, G. Thoröe, S. Lopez-Gonzalez, L. Reinges, M. H. T. and Lemmen, S. W. 2014. Are chlorhexidine-containing dressings safe for use with ventricular drainages?. Infection, Vol. 42, Issue. 3, p. 545. Özkiriş, Mahmut Kapusuz, Zeliha and Saydam, Levent 2013. Ototoxicity of Different Concentrations Povidone-Iodine Solution Applied to the Middle Ear Cavity of Rats. Indian Journal of Otolaryngology and Head & Neck Surgery, Vol. 65, Issue. 2, p. 168. Dulon, D. Mosnier, I. and Bouccara, D. 2013. Ototoxicidad farmacológica. EMC - Otorrinolaringología, Vol. 42, Issue. 1, p. 1. Dulon, D. Mosnier, I. and Bouccara, D. 2012. Ototoxicité médicamenteuse. EMC - Oto-rhino-laryngologie, Vol. 7, Issue. 4, p. 1. Ichibangase, T. Yamano, T. Miyagi, M. Nakagawa, T. and Morizono, T. 2011. Ototoxicity of Povidone-Iodine applied to the middle ear cavity of guinea pigs. International Journal of Pediatric Otorhinolaryngology, Vol. 75, Issue. 9, p. 1078. Pothier, David D. and Rutka, John A. 2010. Ototoxic surgical preparation set to be the new standard. Otolaryngology-Head and Neck Surgery, Vol. 142, Issue. 6, p. 919. Book, Samuel E Aasi, Sumaira Z and Leffell, David J 2010. Surgery of the Skin. p. 239. Shiraishi, T. 2009. Adverse Effect of the Disinfectants(<Review>Proper Use of Disinfectant). Iryou kikigaku (The Japanese journal of medical instrumentation), Vol. 79, Issue. 3, p. 131. Weinstein, R. A. Milstone, A. M. Passaretti, C. L. and Perl, T. M. 2008. Chlorhexidine: Expanding the Armamentarium for Infection Control and Prevention. Clinical Infectious Diseases, Vol. 46, Issue. 2, p. 274. 2006. Meyler's Side Effects of Drugs: The International Encyclopedia of Adverse Drug Reactions and Interactions. p. 714. Book, Samuel E Aasi, Sumaira Z and Leffell, David J 2005. Surgery of the Skin. p. 259. Perez, Ronen Freeman, Sharon Sohmer, Haim and Sichel, Jean-Yves 2000. Vestibular and Cochlear Ototoxicity of Topical Antiseptics Assessed by Evoked Potentials. The Laryngoscope, Vol. 110, Issue. 9, p. 1522. Dauman, R. and Dulon, D. 2000. Ototoxicidad medicamentosa. EMC - Otorrinolaringología, Vol. 29, Issue. 1, p. 1. Department of Otolaryngology, Bristol General Hospital, Guinea Street, Bristol. Ballantyne, J. C. (1970) Journal of Laryngology and Otology, 84, 967. 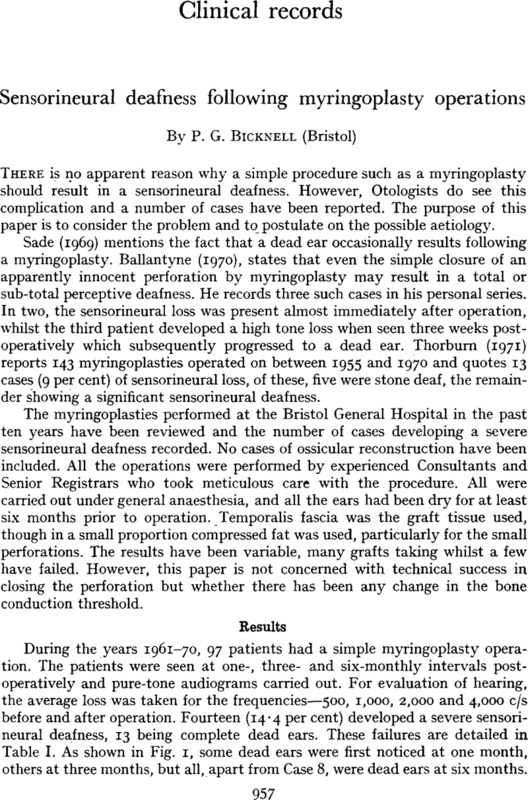 Fowler, E. P. and Forbes, T. W. (1936) Annals of Otology, Rhinology and Laryngology, 46, 859. Kohonen, A. and Tarkanen, J. (1969) Acta Otolaryngologica, 68, 90. Sade, J. (1970) Sensorineuaral hearing loss. London: Churchill, p. 321. Thorburn, I. B. (1971) Personal Communication.